One of the more extreme forms of detox, a raw food diet is only for the very determined. The science behind eating raw food is simple – above certain temperatures (around 116 degrees Fahrenheit) we cook the beneficial enzymes right out of our foods, meaning we miss out on lots of body-boosting nutrients. Eating food as close to its natural state as possible ensures that we’re munching maximum benefits. Advocates of the raw food diet claim that the health benefits are wide ranging, and very similar to those of a more traditional detox diet. Among other advantages, taking the heat off our food is said to lead to clearer skin, healthy digestion, and more energy. 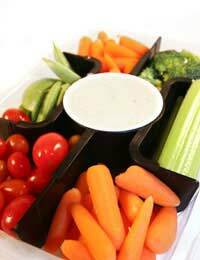 Unsurprisingly raw food dieters are also typically lighter in weight than those who follow a more usual diet. Not much! A raw food diet is said to consist of between sixty and one hundred percent uncooked food, with the rest still being organic and whole. Needless to say, meat, poultry, fish and eggs are usually off the menu, though some more extreme detox diets do permit the consumption of raw fish. With a raw food diet being made up primarily of fruit, vegetables, beans, grains and legumes, a juicer is an essential piece of kit. You might also want to try sprouting your own foods. Beans and seeds can be sprouted and eaten raw, giving your body a nutrient-packed hit of protein, enzymes and amino acids, to name a few. Sprouts are a great way to add extra interest and texture to salads. Following a strict raw food diet takes both discipline and imagination. If you’re not keen on salads and fruit and vegetables, give this diet a miss. If you’re feeling adventurous though, think vegetable sushi, exotic salads and vitamin-laden juices and smoothies. Snack on nuts and seeds if you need a boost between meals, or try dried fruit for a tasty filler. Ease yourself onto a diet like this by eliminating cooked food gradually. As with any extreme form of detox diet, the risks involved in a raw food plan involve missing nutrients. When we exclude entire food groups from our daily diets we also exclude the nutrients contained within them, meaning that long term, such diets are not sustainable. A raw food diet may not contain sufficient minerals to keep our bodies healthy, so it’s important that you find out how such a plan may affect you before you begin, particularly if you belong to a ‘high risk’ group. If you are feeling particularly disciplined, a raw food diet can be a fantastic way to kick start your body’s natural detoxification process, ensuring you obtain the maximum goodness from the food you eat. Short term, a plan like this won’t do you any harm, but as this is an extreme form of detox, it’s a good idea to have a chat to a medical professional before you decide whether or not to give it a try.